WASHINGTON, D.C. – On Dec. 7, 1941, 5,000 Nisei (second-generation Japanese Americans) had been drafted to serve in the U.S. Army. With Executive Order 9066 in hand, though, Military Governor Lt. Gen. John L. DeWitt decided to discharge all those Japanese Americans on the west coast and send them home. He was also responsible for forcing more than 115,000 persons of Japanese ancestry into relocation camps. On the July 15, 1946, President Harry Truman reviewed the 442nd and confirmed their loyalty. “You fought the enemy abroad and you fought prejudice at home and you won,” he said. 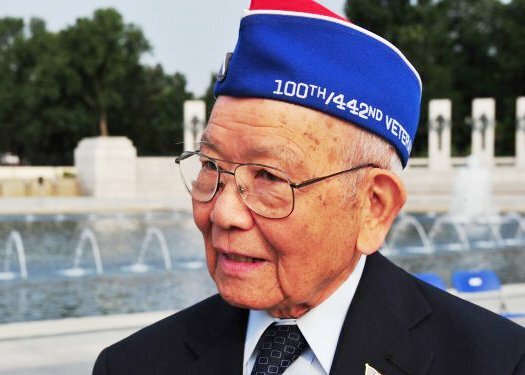 “Only 70 years ago, this same Japanese American (Sen. DANIEL INOUYE of Hawaii) was given draft classification 4-C, which stood for enemy alien, unfit for military duty.